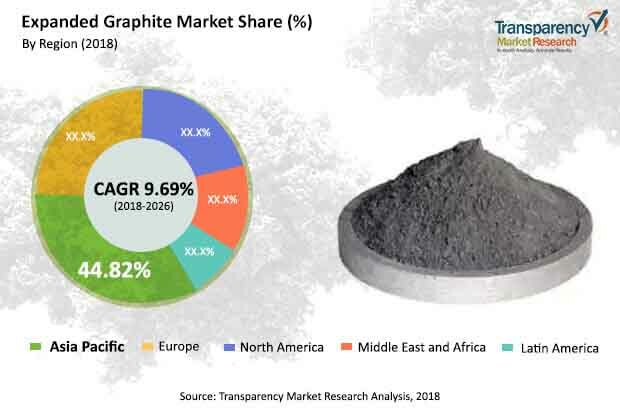 The global expanded graphite market was valued at US$ 175 Mn in 2017 and is anticipated to expand at a CAGR of more than 9.5% from 2018 to 2026, according to a new report published by Transparency Market Research (TMR) titled ‘Expanded Graphite Market – Global Industry Analysis, Size, Share, Growth, Trends, and Forecast, 2017–2026.’ Expanded graphite, also known as intumescent flake graphite, is a specific kind of intercalated graphite that expands or scales off on heating. When flake graphite is treated with an intercalation reagent such as acids, the reagent moves in between graphene layers, after which the intercalated flake graphite is heated at a high temperature (around 1000ºC). This heating breaks down intercalation compounds into gaseous products. This exerts a high amount of pressure in between graphite layers. This pressure results in separating of graphite layers, leading to increase in volume to up to 300 times than normal. It also increases surface area while reducing the bulk density of the product. Increasing demand for fire-resistant building materials from residential and non-residential construction sectors is expected to drive the demand for expanded graphite in the near future. Government and regulatory authorities mandating the usage of fire-resistant building materials for residential and non-residential construction to reduce the number of fire accidents is estimated to be a key driver of the market during the forecast period. As expanded graphite has excellent resistance to fire, they are widely used in the manufacture of fire-resistant products such as gaskets and building materials. Moreover, graphite foils manufactured from expanded graphite are also highly used in electronic products due to their excellent conductivity of electricity and heat. These foils drive the heat generated in electronic components away from the system and protect them from damage. Thus, increasing demand for consumer electronic products is likely to be a key driver of the market between 2018 and 2026. However, limited supply and high prices of expanded graphite are expected to act as a major restraint of the market from 2018 to 2026. Due to supply disruptions from China, prices of expanded graphite have risen by up to 20% over the last few years. Ban on use of hazardous fire-resistant materials in several countries across the globe is likely to provide new growth opportunities to the market in the next few years. Use of brominated or asbestos-based fire-resistant materials in the manufacture of buildings, gaskets, and other products has been banned in several countries. The requirement for new fire-resistant non-toxic materials can be easily satisfied by expanded graphite, due to its inherent properties. The expanded graphite market can be segmented based on form and end-user. In terms of form, the market can be classified into powder and others. Powder was the dominant segment, accounting for more than 60% share in terms of value in 2017. It is expected to continue its dominance during the forecast period. However, the others segment is likely to expand at a rapid pace during the forecast period. Based on end-user, the expanded graphite market can be divided into chemicals & petrochemicals, foundry, energy storage, construction, and others. The foundry segment dominated the global expanded graphite market, holding more than 30% of the market share in 2017. This trend is projected to continue during the forecast period. However, the construction end-user segment is anticipated to expand at a significant pace in the near future, primarily due to increase in the demand for fire-resistant building materials from the construction sector, especially in Asia Pacific. In terms of region, the global expanded graphite market can be divided into North America, Latin America, Europe, Asia Pacific, and Middle East & Africa. Asia Pacific held a leading i.e. more than 40% share of the global expanded graphite market in 2017. This can be ascribed to the dominance of China, which is the largest producer as well as the largest consumer of expanded graphite across the word. The country accounts for approximately 80% share of the global production of expanded graphite. Moreover, the market in Asia Pacific is likely to expand at a significant pace during the forecast period, primarily due to presence of developing economies such as China and India in the region, wherein sectors such as construction, energy storage, and foundry are booming. Key players covered in this report on the global expanded graphite market are GrafTech International, Nippon Kokuen Group, Yichang Xincheng Graphite Co., Ltd., Nacional De Grafite, Asbury Carbons, Triton Minerals, SGL Group, NeoGraf Solutions, Shijiazhuang ADT Carbonic Material Factory, ACS Material, LLC, LKAB Minerals AB, Graphex Mining Limited, Qingdao Braide Graphite Co. Ltd., and HP Materials Solutions, Inc. (HPMS).